Unique handmade original giftsThere are 52 products. Each original gift is original, each motif of a particular product is handmade and different from any other. If you want to give a very special, different and original unique gift to your partner, wife, husband, business partner, friend or your child, they can be more than suitable for: birthdays, anniversaries, as a business gift, as a New Year's Eve gift, as a Christmas gift or a gift just for fun. All unique handmade and original gifts are made from skin friendly materials which are nickle-free and also suitable to be worn by people with allergies. This crochet set of jewelry in orange is handmade original jewelry for all women who like unique, timeless and practical gifts. The orange crochet jewelry is made of black yarn and wire. Important! Before purchasing this orange set of crochet jewelry, please register/log in to Unikatnica. Unique, original and handmade Ladybug earrings in red and black colour. Each Ladybug is made from Cernit and Fimo clay, suitable for birthday, holiday and business gifts. a wonderful, original and cute black set of cat jewelry - a ring and earrings with a handmade motif of a white cat - repreesnts a beautiful and thoughtful gift for all women who like cats. IMPORTANT! Before purchasing this set of black cat jewelry, register/log in to Unikatnica. This beautiful bee pendant is handmade, ooak and handpainted pendant for women which makes a unique and special gift for special occasions. A bee symbolises a hard working, loving and caing person. Before purchasing this bee pendant, please register/log in to Unikatnica (above right). Unique, original and handmade Ladybug set of jewelry (earrings, a pendant, a ring) in light blue and black colour. 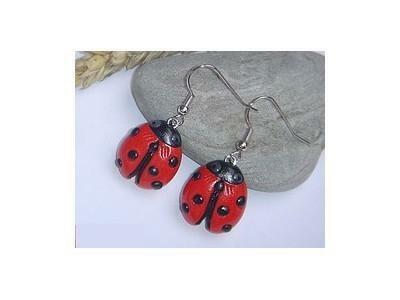 These Ladybugs represent a very lovely birthday, business or holiday gift for women. IMPORTANT! Before purchasing this light blue set of Ladybug jewelry jewelry, please register/log in to Unikatnica. Unique, original and handmade Ladybug earrings in pinky and black colour. Each Ladybug is made from Cernit and Fimo clay, suitable for birthday, holiday and business gifts. Important! Before purchasing these pinky-black earrings, please log in/register to Unikatnica. Unique, handmade Horoscope pendant with Taurus sign for women with a Zodiac sign of Pisces. This handmade Taurus pendant for women is very practical and useful gift for women. IMPORTANT! Before purchasing this Taurus pendant, please register/log in to Unikatnica. Unique, hand-made Horoscope pendant for women with a Zodiac sign of Scorpio. Unique, original and handmade Ladybug set of jewelry (earrings, a pendant, a ring) in sparkly red and black colour. These Ladybugs represent a very lovely birthday, business or holiday gift for women. IMPORTANT! Before purchasing this red set of crochet jewelry, please register/log in to Unikatnica. Unique, hand-made Horoscope pendant for men with a Zodiac sign of Scorpio. Unique, hand-made Horoscope pendant for men with a Zodiac sign of Gemini. Unique, hand-made Horoscope pendant for men with a Zodiac sign of Leo.